The team at Impression Technology Europe (ITE) were excited about Sign & Digital UK as it gave them the opportunity to show off the latest machines from Compress, the iUV-600s and the iUV-1200S as well as a host of other machines. 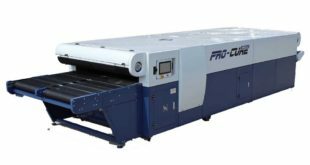 The Compress iUV range is taking the industry by storm as both machines, utilising UV LED technology, give the user the ability to print exactly what they want, when they want and onto whatever they want. 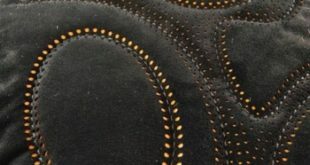 Both machines use industrial print heads which feature 1440 nozzles capable of delivering a minimum picolitre drop of just 3.5Ng producing ultra-fine dot placement. 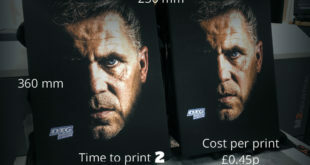 When configured with up to six colours of CMYK plus white and clear the machines deliver print at an incredible speed and with remarkable brilliance. 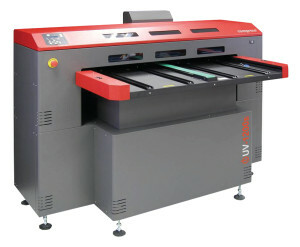 The iUV-600S has a maximum print area of 604x450mm while the larger iUV-1200S boasts a maximum area of 1200x604mm. With both machines sporting an adjustable print height of, up to, 300mm – the largest media height of any printer in this class – the iUV range is setting new standards in promotional printing. Each ink is delivered via a 250ml pressurised ink tank giving a constant feed to the damper while the white inks are recirculated through the unique WIMS filtering system. This ensures low maintenance and less downtime making the machine more productive. Both machines can also produce high quality prints at low resolutions due to the unique iQ Interweave firmware. This ensures that the machines print in a particular pattern thus avoiding the problem of banding commonly seen when orienting at lower resolutions. There is even an optional unwind/rewind solution for roll media. The machines are different and in the best possible way. The UK-based developers have looked hard at the industry and recognised what would make a difference and the result is astounding. Impression Technology Europe also promoted products in the embroidery and direct to garment printing industries. For embroidery the team demonstrated the latest single head machine from Ricoma. This is the first compact bridge machine and the bridge facility makes it one of the most flexible models available. It will sit nicely in any embroidery plant but it also offers a much increased embroidery area to the mobile embroiderer. 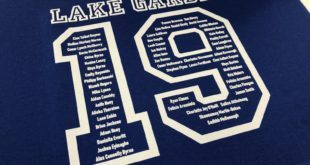 Direct to garment printing was represented by the amazing M2 from DTG Digital. The M series of machines are recognised as being the only ones to successfully bridge both the bulk and small order markets. The M2 has an enlarged print area meaning you can load as many as four T shirts at a time or utilise the area for a single large item such as a table cloth or banner. These machines use the same firmware, iQ Interweave, as the Compress machines and therefore, just like them, offer high quality prints at low resolutions. This allows for much higher production figures than is normal for this type of machine and, of course, will therefore generate more income.